A dull apocalypse film with far too little action and no interest in the drama. Signature UK R0 DVD. The first of a handful of weather based films for the SyFy Channel made by Kenneth M. Badish's Active Entertainment, Quantum Apocalypse is written by Leigh Scott (a frequent collaborator with DTV merchants The Asylum, including writing and directing Transmorphers (2007)) and has a pretty typical disaster movie format, giving us a selection of subplot and supporting characters who will be affected by the impending drama. The plot certainly makes an interesting twist to the usual meteor destruction and the descriptions of the "anomaly" at least sound convincing enough (to someone with no knowledge of advanced physics). The idea of a force that can cause massive shifts in weather, gravity and even time would seem to be perfect for making a special effects driven 'end of the world' movie, unfortunately Quantam Apocalypse simply does not live up to this. Presumably a reflection of the production's low budget, there are a mere handful of actual disaster sequences - a brief shot of New York (yet again) being struck by a tidal wave and London being hit by some wierd graviational flux - so the storyline is left to carry 99% of the runtime and Scott's script is just not good enough. The main character is a small town mayor and his 'special' brother who is clearly an example of Chekhov's Autistic (cf. The Cube (1997)), taking the Jeff Goldblum character from Independence Day (1996) and running him through a post-Big Bang Theory extra-socially-awkward filter. On their own they make for interesting characters, but adding a dull son and his cliched "high school girlfriend and her ex" storyline and introducing his wife as a sassy, hard-as-nails cop (which she only remembers to be in the final chapter for some reason), just comes off as padding. The arrival of the "rock star scientists" at the space agency are similarly annoying, not sufficient to have one socially awkard character, we now get three - obviously Scott finds watching autistic people trying to communicate to be entertaining, for everyone else it is just tiresome and the whole aspect is simply unnecessary, the script introduces a number of clever minds at the USSA (a faux-NASA agency) and there really is no reason for the surperfluous extra characters, the government scientists would have been perfectly believable at solving the crisis. A subplot involving the President (who seems to be staying in a Best Western hotel) feels to have been added in later and adds nothing to the storyline, perhaps it pads out the time that would have been spent showing disaster scenes? The film drifts along slowly, feeling more like a drama at times with its endlessly long sequences involving the supporting cast, with no connection to the actual titular doomsday scenario - we are supposed to believe that all of the phone lines are down, weird lights appear in the sky and all flights are stopped, without most people even caring? Even when things do start to hit the fan, the film's lack of budget mean that we get told about massive earthquakes and global crises without actually getting to see anything. Even allowing for the impoverished production, there are no excuses for the script's laziness and inconsistencies - a big deal is made about gravity being distorted, at one point two characters are actually able to lift a car and throw it, yet nothing else is affected and even rain falls normally in a following scene. As expected, a solution is eventually found to the anomaly and we can watch in excitement as they run computer formulae to solve it... With still no real coverage of the global apocalypse, the film drifts to a predictable climax and a stupid ending that would surely elicit annoyance were there not such delight at this film finally finishing. Director Justin Jones takes a pretty straight forward approach to the character scenes, not unpredictably, they get the job done but without any flair. The CGI special effects are not the worst, but obviously the producers were not willing to invest enough in the film to allow them to be more than mere snap-shots and it seems so duplicative to re-drown New York a la The Day After Tomorrow (2008) rather than doing something a little more original. The only good looking disaster shots were clearly just filmed after a real life flood or high winds and as a result actually feel rather exploitative. Unsurprisingly, the acting is not up to much here. Rhett Giles does the best job as the autistic Terry, while Randy Mulkey never looks particularly interested but does fine as his brother, the mayor. Stuart Lafferty as his son and Stephanie Jacobsen as his wife are painfully bad while the rest of the cast are a mix of utterly terrible, or just completely bored. Many good films have been made on low budgets, the trick is to understand the limit of the budget and work with it - trying to make an epic doomsday film with a special effects budget that covers less than a minute of actual disaster footage and just having characters tell us what is going on was just never going work and when you have a script writer unable to produce interesting subplots or characters and uninterested actors, the result is a pointless drudgery. 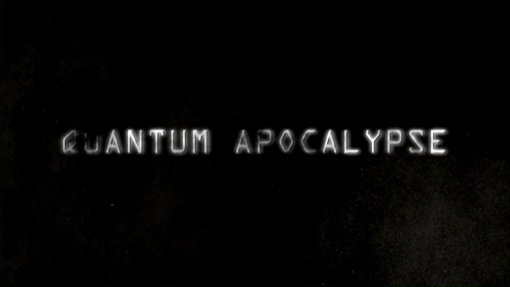 With nothing whatsoever to recommend it, Quantum Apocalypse is a dud - don't waste your time. Directed by anyone	interesting? Justin Jones - an occasional director, he also helmed another budget disaster piece The Apocalypse (2007) but mostly works as an assistant director, including DTV projects like Universal Soldiers (2007). Who is it for? Not recommended to anyone. A solid digital transfer with no problems. Boring and drawn out attempt to make a disaster movie with no disaster scenes. Dull and pointless. A fine but featureless DVD. All text in this review written by Timothy Young - 9th November 2014.